Events in GDevelop allow you to visually program your game without any prior programming knowledge or experience, so anyone with any background will be able to create the actual gameplay and allow players to interact with the game. Even for experienced programmers, events are fast to write and read. They allow artists, designers, level designers and anyone working on the game to understand and update the rules of the game. Standard event: this event is the default one and is triggered every single frame. It executes the actions once the conditions are true, then move on to the next event. For Each event: this event is triggered for each and every instance of the selected object, checks the conditions, and then executes the actions for each individually before moving to the next event. Repeat event: this event is repeated the specified number of times before moving on to the next event. While event: this event is repeated continuously while the specified conditions are met and moves on to the next event only after the conditions of this event are no longer true. Comments: these events are used to add comments or explanations into an event sheet - they won't change anything during the game. Link: This event allows you to call the specified external event. External events are events that are not linked to a specified scene. You can call and execute them from one or more scenes using Link events. Group: A group contains one or more events. It's an easy way to organize your events into sections. You can collapse the content of the group to hide the events you're not interested in when working. Finally, advanced users can create their own actions and conditions using functions. It's a way to make your events even more modular and adapted to your game. In order to add events to our game, first we need to switch to the event editor. We can do that using the event tab next to our scene tab. 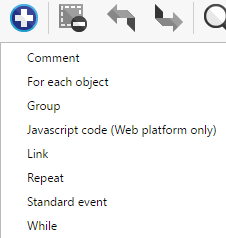 We can add any number of conditions and actions to each event. To add conditions and actions we need to click add condition and add action inside the event, then we can choose from many options sorted in to different categories. In order to learn more about how to use the different conditions and actions, we recommend to read the tutorials and guides available on the wiki. You can also create your own conditions and actions using functions.